Recurrent Energy has signed a 20-year deal with Austin Energy to build a 150-megawatt solar farm in West Texas that would help power Austin. Expected to be completed in 2016, the facility would be the largest single solar site in the state. A San Francisco-based firm plans to build Texas’ largest single solar facility, which would help power Austin. Recurrent Energy has signed a 20-year deal with Austin Energy, the municipally owned power provider, to build a 150-megawatt solar farm in West Texas, the companies announced Thursday. Recurrent expects to complete the farm by 2016, sending the electricity over transmission lines that connect West Texas and Austin. The parties declined to discuss other details, such as where the facility will sit or how much it will cost. Austin had been considering a 25-year, $525 million contract with SunEdison, which was thought to be one of the world’s cheapest solar deals, the Austin-American-Statesman reported in March. Austin Energy said the Recurrent proposal provided the best deal for the city. On average, a megawatt of solar energy can heat and cool as many as 100 Texas homes on the hottest summer days. During average temperatures, it can power many times more. Texas, with its long-stretching boundaries and intense solar radiation, leads the nation by far in solar energy potential. Much of that resource is in West Texas, which sees 75 percent more direct solar radiation than East Texas, according to the State Energy Conservation Office. But the industry has long struggled to get a foothold in the state, as policymakers have provided fewer incentives than other states. Solar energy currently makes up a tiny fraction of Texas' energy portfolio. The Recurrent Energy project and others are indicators that solar power is becoming increasingly competitive with other energy sources. Assuming that other contracts don't change, the solar plant's completion would bring Austin Energy to its goal of getting 35 percent of its energy from renewable sources by 2020, including 200 megawatts from solar power, a spokesman said. “We have learned a lot about how to incorporate renewable power into our overall portfolio," said Larry Weis, general manager of Austin Energy. The new facility would be far larger than the 30-megawatt Webberville Plant, a few miles east of Austin, that currently powers the city. That facility, however, is still among the state's largest. 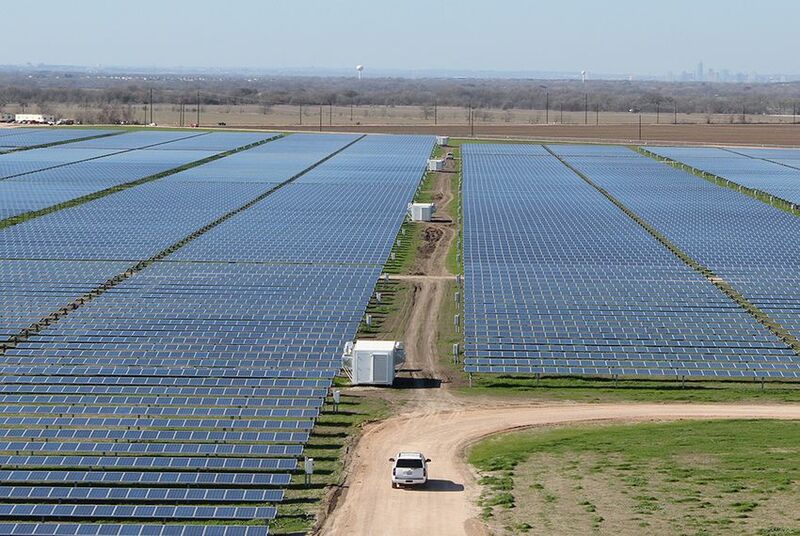 Though Recurrent Energy’s project would be the largest single solar facility in Texas, CPS Energy in San Antonio is planning a multiplant project that would dwarf it in total capacity. The Alamo Project, expected to be completed in 2016, would deliver 400 megawatts of solar power to the San Antonio area. The utility has already energized a 41-megawatt plant that is part of the project. San Antonio ranks sixth among U.S. cities in installed solar capacity, and Austin ranks 16th, according to a report released last month by the advocacy group Environment Texas.